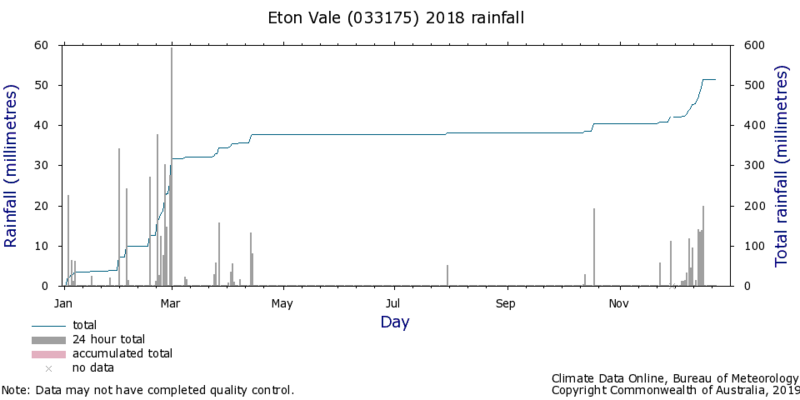 IT’S not just the recent weather that makes us want to look back on the year’s rainfall, it’s also the time of year when we reflect. Weather is such an important component to grazing, and the New Year is a good time to share some weather-related summaries produced by Australia’s Bureau of Meteorology (BOM). Graziers know data at bom.gov.au/climate/data/stations/ is a handy reference when judging production for the past year. Our perceptions of the weather can often over-ride realities of what the rainfall patterns were across the region, particularly during periods of drought. A number of sites in the BBB catchment are registered BOM recording sites and submit data daily. Summarising and mapping the 2018 rainfall totals shows just how below-average totals were for the catchment. It also highlights the value of the major rainfall event delivered by ex-Cyclone Penny. For each recording station, a graph of the distribution and cumulative totals of rainfall events during the year can be downloaded via a few clicks. These site records from across the catchment are very valuable in understanding the local catchment and its pastures, soils and hydrology. If there are landholders keen to share long-term rainfall data with the LDC project to enhance this understanding, please get in touch. The BOM reported regional Queensland had its fifth-warmest year on record using mean temperature as a criteria. Large parts of the southern and central interior reported rainfall totals that were in the lowest 10 per cent of historical records. Click here for a summary of Queensland’s 2018 temperature and rainfall data. Here is the recently-released Australian state of the climate report. 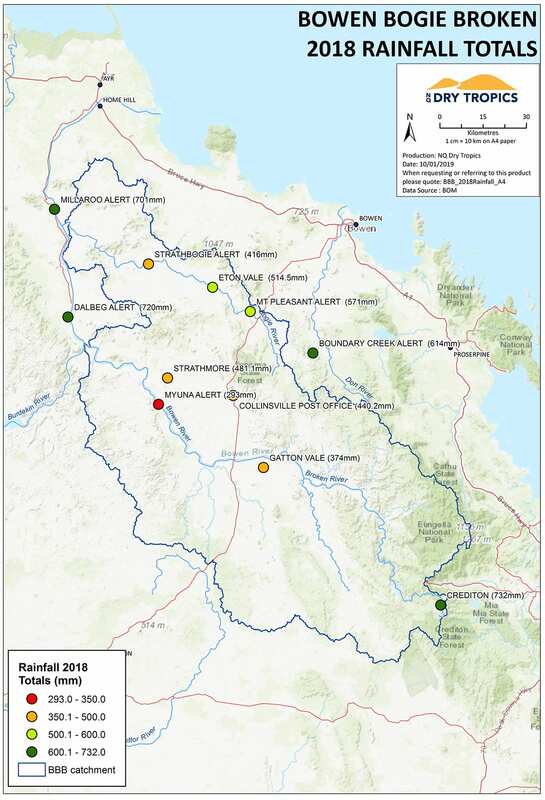 Weather outlooks for 2019 are here, and the latest river heights and rainfall for sites in the Burdekin catchment are here. Some of 2018 data from across the BBB is shown below.